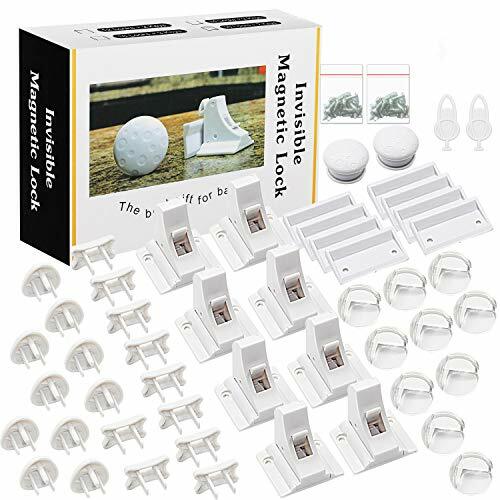 Baby Proofing, 44 PCS Magnetic Cabinet Locks Child Safety, 8 Cabinet Locks + 2 keys, 10 Corner Guards, 20 Outlet Plug Covers, with Strong 3M Adhesive Tape and Metal Screws by ARNIL at My Pregnancy Place. Hurry! Limited time offer. Offer valid only while supplies last. For any parent, the main concern is the safety of their children at all times. This is why they strive to make the house as baby proof as possible. For any parent, the main concern is the safety of their children at all times. This is why they strive to make the house as baby proof as possible. One of the most important things is to ensure your cabinets are also baby proofed as babies can open cabinets and accidentally harm themselves with household chemicals or by touching any sharp objects. Also, the sharp edges and openings can hurt your kid. This is why it is necessary to use our baby proofing products. Magnetic cabinet locks: Lock your drawers and cabinets to prevent toddlers from dangerous objects or messing up kinds of stuff. And you can use the flip switch to put off/on the lock. Clear Corner Protectors: Clear corner guards can cover the sharp corners to protect your baby. Outlet Plugs Covers: Put the plugs covers in the socket and remove it with the key. Pay Attention: Please clean the surface before sticking the tape. And leave them alone after 24 hours. 8 PCS Baby Magnetic Cabinet locks: They have a very tight magnetic design to ensure that your kid's fingers never get stuck in the frame or doorway of the cabinet. The baby cannot access the lock as the lock is mounted inside the cabinet. This is effective as most kids are only interested in things they can touch and feel. The Magnetic Cabinet locks uses adhesive tape to install them. And the metal screws could make the locks much tougher. 10 PCS corner protector, Non-toxic, Strong 3M Adhesive Tape, Protect your loved baby against painful bumps, injuries and bruises from sharp furniture and table corners. Great for growing toddlers or even that counter or cupboard you always get snagged on. 20 PCS outlet plug covers with 2 keys, Non-toxic, These outlet plugs snap in like many other plastic plugs but require you to insert a plastic "key" to remove the plug. Without the use of the key, the caps are difficult to remove from an outlet. This makes them a good choice for a home with babies or toddlers. 30 DAYS GUARANTEE - If you ever have any issues with the baby proofing, contact us and we will expedite you a new one absolutely free or refund your payment in full! If you have any questions about this product by ARNIL, contact us by completing and submitting the form below. If you are looking for a specif part number, please include it with your message.